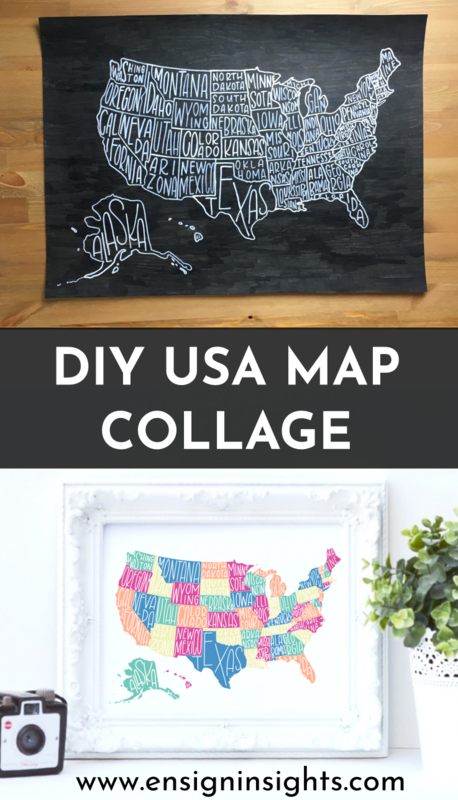 Have you seen a USA map collage? Like everywhere? Every time we see one my husband wants one. The ones I’ve seen are really expensive because they are normally on wood and they are huge. For Valentine’s Day, my husband and I decided we weren’t going to spend any money on each other, but I wanted to get him a USA map collage. So I had to figure out how to do it with things I already had. I’m pretty pleased with how it turned out, and the best part is that my husband loves it! Before we get into the tutorial, if you don’t want to DIY I have several versions of the USA collage map in my Etsy shop. A white on black one, a colored one, and one you can color in yourself. Along with the 8×10 version, it includes the HUGE files in case you want to get them printed as a 24×36 engineering print (less than $5 at office stores). First, prepare your poster. I used a white poster and painted over it with a black paint pen. I wanted that brush stroke, textured look. You may just want to start with a black poster board or any color really. You can also use a wood board or chalkboard. Next, you will need to download and print out the traceable USA map outline. In this PDF you will receive 6 pages that you will need to piece together. I have given you the option of a small Alaska or a large one. My husband is from Alaska and we lived there so I had to make it as big as I could (although it’s even bigger!). Once you have that ready, you will use a non-mechanical pencil to color in the back of the map. Scribble anywhere that there is a printed line. Now you will lay out your map on your poster. You may want to tape them together so it doesn’t move as you trace. Trace over all the lines of the map so the pencil on the back side will be transferred to your poster. Next, you will remove the map you just traced and use your chalk marker or paint pen to trace all of the lines. I love my Kassa chalk marker (this is not a sponsored post, I just really like them) because it gives it the chalkboard look. Now comes the fun part! Filling in the states! It took me a while to sketch out each state so I could fit the whole word in the shape, I definitely had to get creative. The way I did it is definitely not the only way to do it. See what you can come up with! I’d love to see what you do! If you post to Instagram, make sure to tag me (@ensigninsights). What can you do with a USA map collage? I printed a blank USA map to color in the states that have received my book Fearless Lettering. You can do this with your Etsy/business orders. It was amazing to see how few states I have left! You could print out a big one and put heart stickers anywhere that you have lived or visited. You could print out pictures from your visit to each state and glue them in the right state. Do you have other ideas of things you could do with this? I’d love to hear!